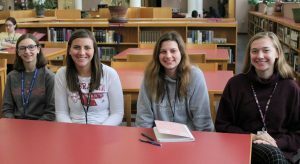 Pictured below: GHS IB diploma candidates Katie Shirk, Emma Simpson, Josie Walters, and Maggie Gallagher. The IB students decided to put their project proceeds toward GHS Unified Sports to raise awareness about the growing GHS Unified Sports program, to highlight the students they care about, and to raise funds to help the students with their team costs. As stated previously, the Unified Dance Marathon will be open to everyone! There will be dance music provided by a DJ, a raffle with great prizes generously donated by local businesses, games for all ages, food to buy from the concession stand, and supervised quiet areas for those with light/sound sensitivities who might need to take a break from the action. The students are not taking pledges for the dance marathon. Instead, they will charge an entry fee to get into the event. The suggested entry fees are: 5th grade and under = free, 6th grade and up = $5.00, and families = $10.00. However, no one will be turned away if they cannot afford the entry fee. Additionally, since this is a fundraiser, anyone who wants to pay more than the suggested entry fee is also welcome to do so! The Unified Dance Marathon will be run by IB students, along with help from Student Council and National Honor Society students. The students have purposely extended the invitation to the entire community because they value the diversity of Goshen, and want to bring everyone together for an evening of family fun. We hope you will join them! !